This is the dog my family loved. Teddy is a German Shepherd that my nephews bought as a puppy. For seven years he became a member of the family and the guardian over their house. German Shepherds are known for their loyalty among many other things. He strayed only once . He was so much fun at family dinners. If you wanted to keep him distracted so he didn’t grab the turkey or the ham, just get a handful of carrots off the relish tray and he would jump for them even “speak” on command. He was my sister’s best pal and she would walk him all around the west side and through the downtown riverfront. He wasn’t the “big baby” in the family, but he loved attention. All dogs do, I guess. He was laid to rest a few months ago. Canine cancer is not easy for owners to see. Dogs tend to hide their pain well. Its a trait they retained from wolves that they do not show weakness lest they lose their position in the pack. I’m sure the good Lord will find a dog just like him for my sister when she too passe away. 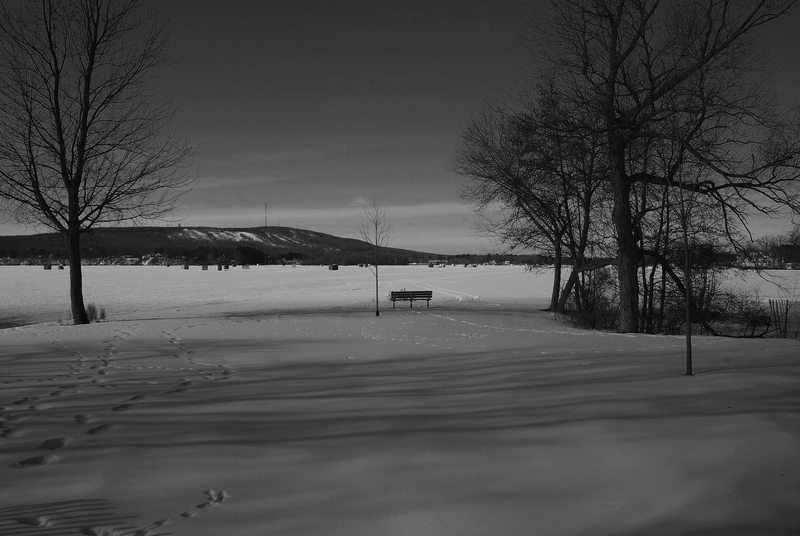 The loneliness of a snow covered park bench facing a desolate shoreline in the middle of Winter at Lake Wausau's D.C. Everest Park. I often admired the stillness that Winter brings to Wisconsin. It has a peace and tranquility all of its own. This photo was taken by following the book on digital black and white photography. I started by shooting the scene as a normal camera RAW file using a 20mm lens (35mm format) on a Nikon D-80 which really means 30mm. With the camera ISO set at 100, I took this image hard focused at 1/80 second +7EV. The real thing is in seeing a color scene in black and white by looking at the tonal differences. After uploading this onto my PC, I went into Capture NX2 and converted the image to black and white and adjusting the exposure accordingly. It is shooting in color, but thinking in black and white. The bench on the lake shore carries that thought quite well…..